I'm not sure of the manufacturer of the papers but I did use a couple of metal embellishments from Making Memories ( I think they were a Hobbycraft bargain!) and the large chipboard letters are K & Co. These were one of the first things I bought to scrapbook with and like so much of my stash remained unused (until now of course!). I was slightly too late adding my pic (totally my fault!) 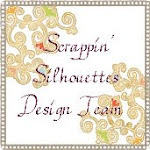 so my pages are not on the site with the DT's but there are some fab LO's to look at there so please go visit this weeks Scrappin' Silhouette Challenge! Also there are a few more of my fellow DT members introduced... I am so lucky to be surrounded by such talent and really hope some of it rubs off on me!! Nicely done. I'm glad you finally got a photo of this. terrific take on the challenge love your pics.